Over 500 persons from 45 countries have stayed with us, and you ? This recently renovated cozy air-conditioned apartment (big living and bed room) has a nice terrace where you can enjoy the breakfast croissants bought from the boulangerie next door. Oriented est-west, wifi. The beach is only a stone throw away, at a perfect distance for a quick swim in the morning before heading to the buzzing city center. Or why not stay sunbathing the whole day! In the evening you can take a refreshing shower after sipping a glass of wine at the corner bistro downstairs. The apartment has 2 balconies – so guests enjoy both morning and afternoon sun. You’ll instantly feel good in this pretty, bright apartment! It is well located on the 4rd floor of a secured building with a lift. The apartment has a fully fitted kitchen with a bar table, a living room with a big convertible sofa and a flat-screen TV. If you want, you can walk to the famous Old Town along the sunny Promenade des Anglais or take one of the frequently running buses that take you to the center in 15 minutes. There is also a “city bike station” next door, if you prefer hitting the road by bike! For your complete comfort we provide bed linen, towels, ironing material, hair dryer and a washing machine. High speed internet and cabled television are also included. To enter the building you need an electronic pass, along with the key to the flat door. Free parking can be found in the street below. You can enter the porch of the building with your car, very practical to load/unload your luggage from your car. Cozy studio in the center of Nice, quiet, air-conditioned. 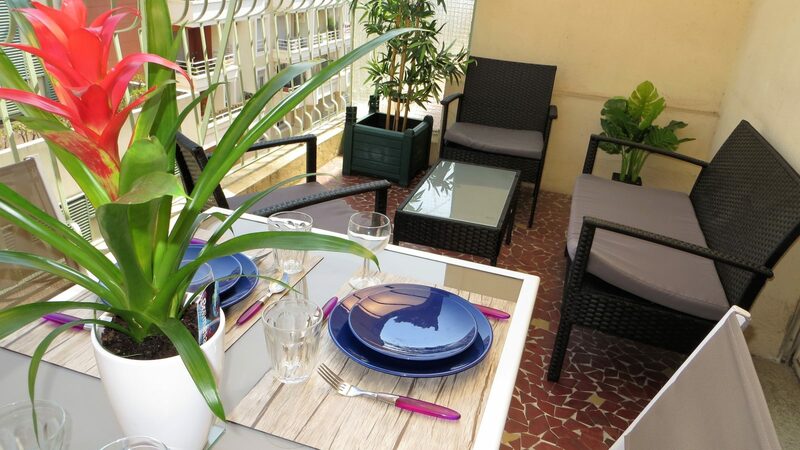 Cozy studio in the center of Nice, quiet, air-conditioned, ideally located for a couple or small group or family wanting to visit Nice. 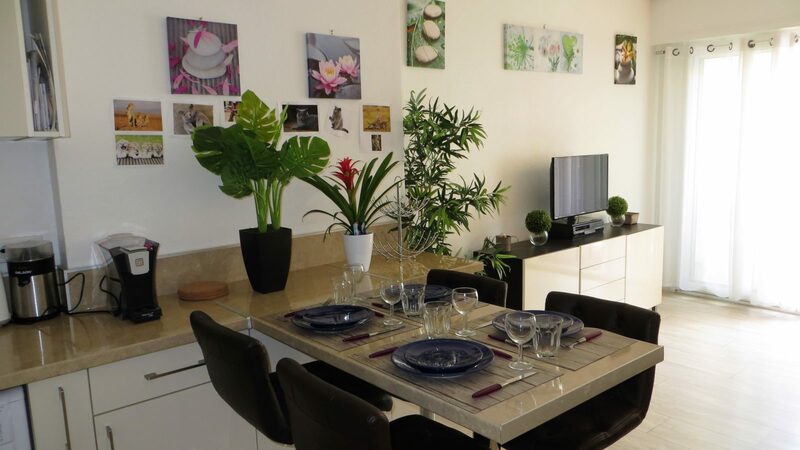 Completely renovated, cozy apartment for up to 3 persons, right in the center of Nice, but quiet, fully A.C,, 50 meters away from the avenue Jean Médecin. An 8 minutes walk to the beach, 2 minutes to the place Masséna, 2 minutes to the tramway stop and 10 minutes to the railway station. Restaurants and shopping mail are a stone throw away. You can go for a quick swim in the morning before visiting the buzzing city center. 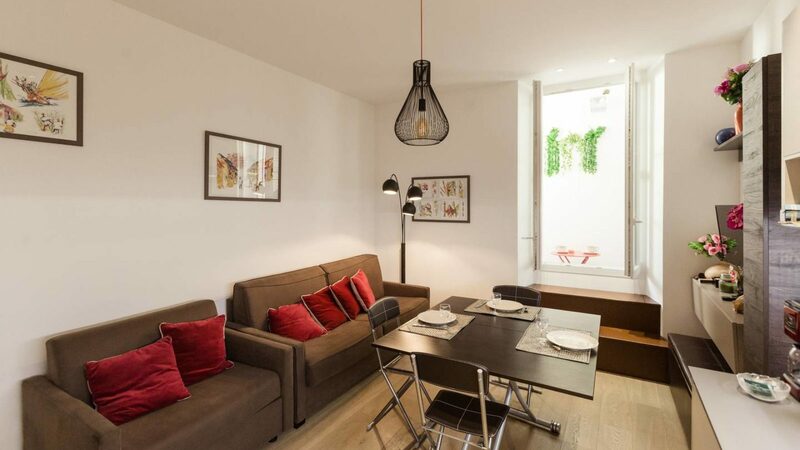 You’ll instantly feel good in this pretty studio apartment! It is well located on the first floor of a secured building. For your complete comfort we provide bed linen, towels, ironing material, coffee/tea, hair dryer and a washing machine. The studio apartment has a fully fitted kitchen with a big 2 persons convertible sofa and another 1 person convertible sofa, a flat-screen TV, there is also a convertible dining/coffee table. You can also enjoy your morning coffee in the shady semi-closed loggia, with some fresh croissants bought from the boulangerie downstairs. If you want, you can walk to the famous Old Town, go shopping, swimming or take the train to visit our beautiful region. To enter the building you need an electronic pass, along with the key to the flat door. You need to walk up a stairway to get to the studio. During the summer season relax during your holiday on our beaches, the rest of the year Nice has ideal weather to come an spend weekends or short stays. Nice has record sunshine and a singularity of light that inspired so many famous painters : Matisse, Renoir, Claude Monet, Picasso.